Pope Francis leads the Mass for the canonization in Saint Peter's Square at the Vatican, Oct. 18, 2015. Pope Francis, proclaiming four new Catholic saints who lived simple and generous lives, told priests and bishops on Sunday that service, and not careerism, was the way to exercise authority in the Church. "Those who serve others and lack real prestige exercise genuine authority in the Church," he said at a Mass for about 65,000 people in St. Peter's Square. "Service is the way for authority to be exercised in the Christian community," he said, adding that careerism, ambition, fame and worldly triumphs were "incompatible with Christian discipleship." At the Mass, he proclaimed four new Roman Catholic saints, including the parents of St. Therese of Lisieux, the 19th century French nun who is one of Church's most venerated figures. Their "outstanding humility and charity" was an example for all, he said. 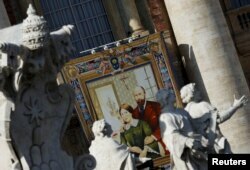 A tapestry showing Louis and Zelie Martin, parents of St. Therese of Lisieux, hangs from a balcony as Pope Francis leads the mass for their canonization in Saint Peter's Square at the Vatican, Oct. 18, 2015. The canonization of Louis Martin and Marie Azelie Guerin marked the first time a married couple were declared saints in the same ceremony and was held to coincide with a world gathering of bishops discussing ways to bolster family life. They were chosen to highlight the key role parents play in the spiritual and human upbringing of their children. Francis praised the couple for practicing "Christian service in the family, creating day by day an environment of faith and love which nurtured the vocations of their daughters." They had nine children, four of whom died in childbirth. The five surviving girls all became nuns, and one was St. Therese of Lisieux, who died of tuberculosis in 1897 at the age of 24. Popularly known as "The Little Flower," the nun of the Carmelite order achieved a worldwide following with the publication after her death of The Story of a Soul, a collection of her thoughts on faith and simplicity. A tapestry showing Maria Isabel Salvat Romero hangs from a balcony as Pope Francis leads the mass for a canonization in Saint Peter's Square at the Vatican, Oct. 18, 2015. Her writings influenced people as disparate as popes and Beat Generation author Jack Kerouac. She was made a saint in 1925 and in 1944 Pope Pius XII proclaimed her the co-patroness of France along with Joan of Arc. Present at the ceremony were the teenage 13-year-old Italian boy and the Spanish girl who the Church believes miraculously recovered from incurable illnesses after praying to the Martins. 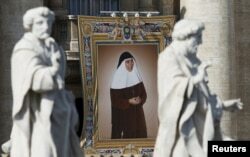 Francis also canonized Vincenzo Grossi, a priest who died in 1917 and spent most of his life helping the poor in northern Italy, and Mari­a Isabel Salvat Romero, a 20th century Spanish nun.